Panerai / Sport / Alligator/Croc / 40-44"
The Panerai Ferrari 003 was designed to highlight the tradition, innovation, and commitment of the Panerai and Ferrari brands. Its unmatched sophistication and style has captured the eyes of both watch and race car enthusiasts worldwide. 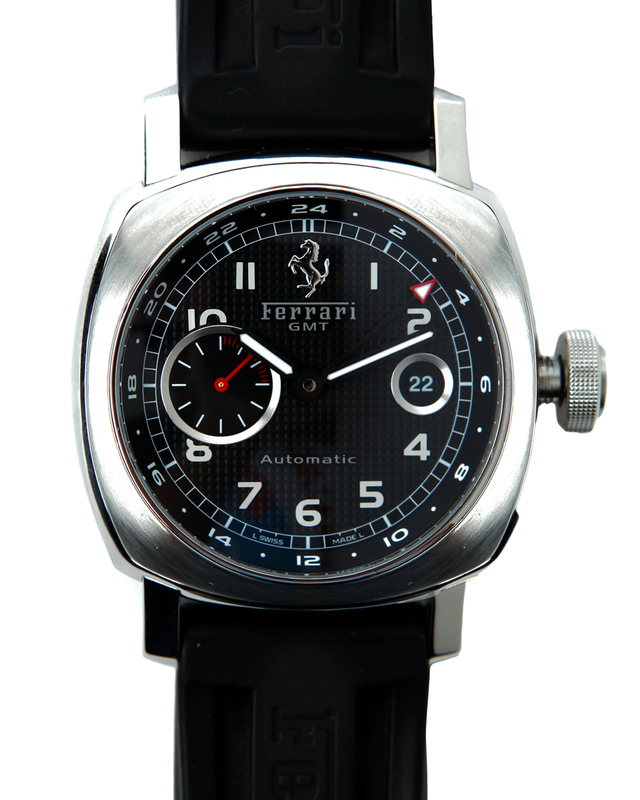 The watch is characterized by its black, square-grid textured dial featuring the famous Ferrari logo and is certain to make a lasting impression. The Ferrari 003 features a GMT complication, for viewing two different time zones, and a date window at the 3’oclock position. The Luminous hands and dot hour markers easily visible and highlighted by the 44MM polished steel case. This pristine timepiece is perfect for ourdoor activities and everyday use.